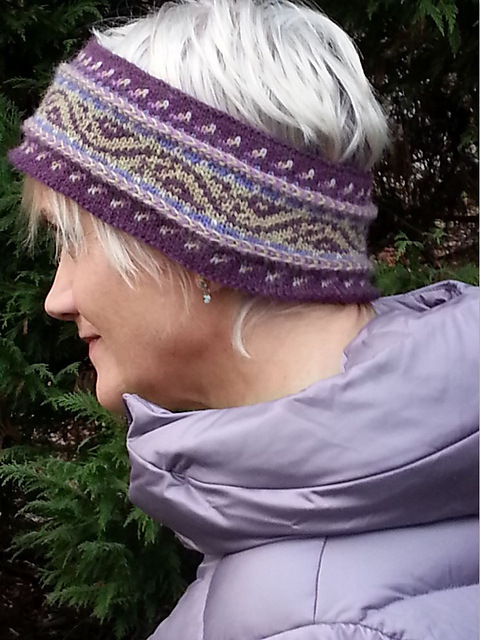 I can tell you that the shaping, scale and fit of this new cowl in Cascade Venezia Sport are quite similar to my old Riverside Cowl, which I knit in Dale of Norway / Dalegarn Royal Alpakka . (See below.) But, the silk in Venezia makes for an extremely fluid drape, so it won’t “stand up” quite as much as my alpaca Riverside Cowl did. That could be good or bad, depending upon your perspective…and your weather. As always, choose whatever sport weight yarn sings to you. 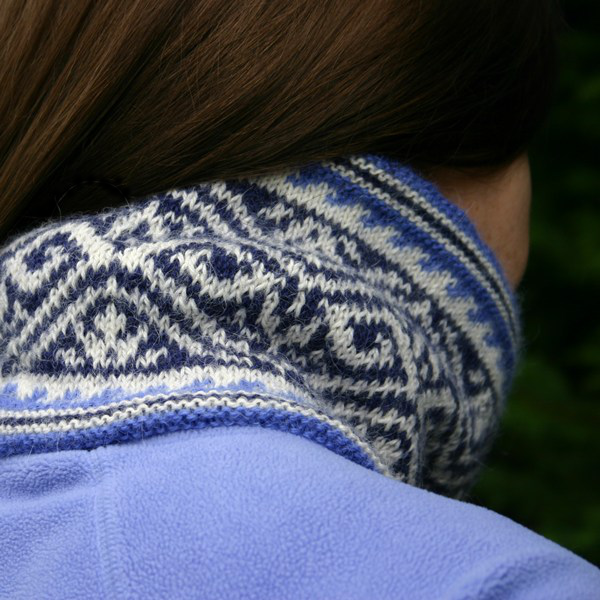 Riverside Cowl, Knit in Dale of Norway Royal Alpakka. 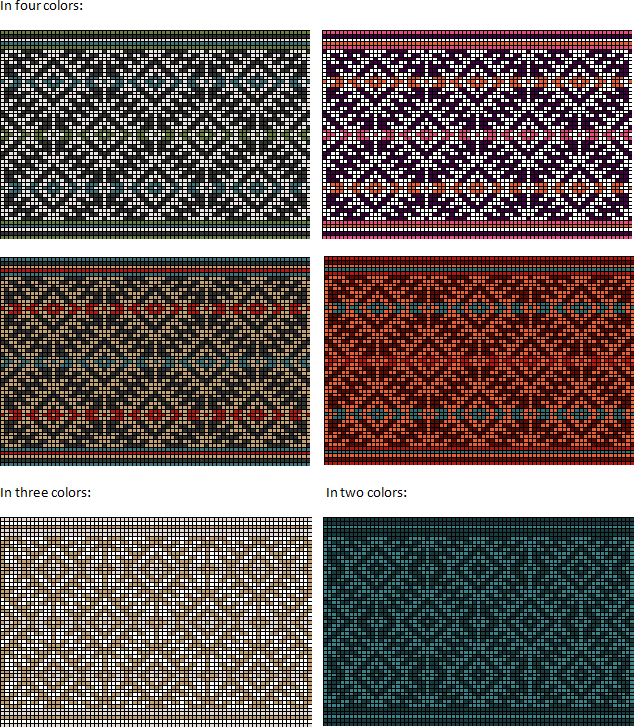 For the color junkies among you (count me in), here are my original color charts for the fair isle cowl design submission (below). The businesswoman in me told me it’s always a good idea to provide variations upon the theme, whenever submitting an idea to be published elsewhere. So, as you’ll see, I did the same chart using two, three or four colors. I guess that was a good move, despite my continual preference for “as many colors as I can get”. But, for the life of me, I can’t relate to their preference for the two-colored version. This entry was posted in Fair Isle Knitting, Knitting, Mary Ann's Designs, Norwegian Knitting and tagged 60 quick luxury knits, Cascade Venezia Sport, cascade venezia yarn, Cascade yarns, cowl, Dalegarn Royal Alpakka, fair isle, knit, knitting pattern, riverside cowl, stranded knitting, tribal motif. Bookmark the permalink. The four strands are stunning. Do you have the colorway numbers for those? Just ramping up my fall/winter/spring knitting projects! Thanks, Vicki, I’m glad you like ’em. I came up with those colors using the then-available array of Cascade Venezia colors. I don’t carry Cascade yarns, so I can’t tell you with any certainty which colors are/will be available for fall knitting, and which ones won’t. So, I’ll do better than list the colors – I’ll give you my “formula” I used for all four of the four-colored charts, so that you can apply the same method to whichever yarns / colors you like best. We want the main motif to remain clear, so the most extreme contrast has to be between the background and the main motif. Light (and/or warm) colors project, dark (and/or cool) colors recede; so, among your four colors, use the darkest (and/or coolest) for the background, the lightest (and/or warmest) for the motif. Use the middle colors for the stripes, which replace the background color for the three rows at the center of each diamond. I don’t get it, either. I think your 4-color choices make this design pop out better. I have a question about the pattern. When finishing up the lining, on the last change to MC, do I change to size 2 needles? If not then when do I change so I have 2 – size 2 needles for the finishing part. Pick up / transfer sts from CO edge to 2nd circular needle. Turn work inside out. Fold work on foldline, wrong sides together, needles parallel, lining facing. *Insert opposite end of lining needle, front to back, through center of first st on each needle; k2tog; psso; rep from * to end of rd. Break off yarn, leaving a few inches; run yarn end through last st; tighten; weave loose end in place. Wash. Block, if necessary. Oh my goodness! 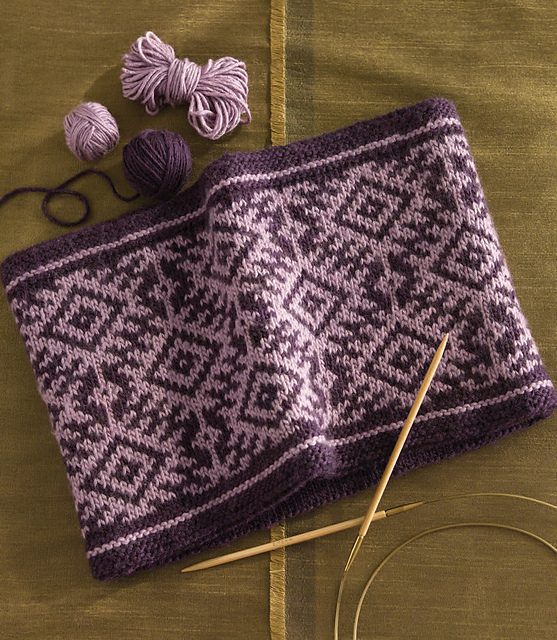 I just spent the last half hour looking at your blog and I just realized I made this cowl! I used the same colors as the sample and I LOVED working on it. The cowl is on display at my LYS where I work. Your patterns are gorgeous. Keep up the great work!